Some time ago I mentioned that my wife was undergoing some serious medical issues that required an operation to hopefully rectify an non-functioning pancreas. Unfortunately, a subsequent M.R.I evaluation indicates that the operation was unsuccessful. Understandably, this dire news will require that we be available to secure other options and resources worldwide, to hopefully remedy or belay her critical situation. To accomplish this I have made the radical decision to free up all my financial obligations in my investment properties, at all costs, within the next 30 days. I am prepared to take a significant loss on my initial investment] by reducing my original selling price on my 22,000 sq. ft. buildings from the already low price quoted to R.E.I. of $599,900. down to $463,800., which is the balance of my mortgages and loans. This is an additional $136,100. reduction savings, and lowers the dollars per square foot to an unheard of $21.04 per sq. ft. - which is more than 50% below all local Botetourt comps. It also means that, at this lower price, the investment “in-cost” of the four buildings calculates to only $115,000. per building. There isn’t another commercial building in the State of Virginia that can be built at this “bail-out” price! And, if there ever was a commercial investment property more structured to group investment participation of your membership, this is the one. 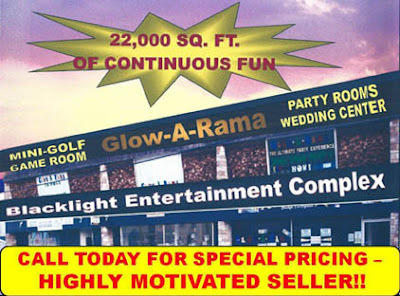 Original Sale Price of 22,000 sq. ft. building of $599,900. Reduced Down to $462,800. + include $37,200 for roof repair & closing costs = $500,000. Gross sale price. OR, Financed on a 20% down Payment [$100,000] = only $4,000. per investment unit. Balance as a group mortgage loan. Dallas, from my many years of experience in commercial investments I must say that there is absolutely no downside to my exceptional offer. Additionally, I sincerely believe that the investment that I am forced to propose, for closing within the next 30 days, may very well be an attractive vehicle to get your members more comfortable with group commercial investments, with no singular liability exposure. Honestly, if I could, with the projected economic growth in the county, over the next few years, I would be investing in as many residential and commercial properties as possible. As always, I would certainly appreciate your valued thoughts, and/or, assistance in this critical matter. Based on R.E.I. 65% valuation method >> $987, 243. Based on R.E.I. 50X rental method >>>> $1,220,000. Based on Insurance buildings replacement value >> $1,320,000. Based on $75. per sq. ft. building costs value >> $1,650,000. VDOT daily traffic count for Roanoke off I-581 Approx 35000 vehicles, while for Botetourt off I-81 Approx 25000 vehicles. Capco Machinery will have a $4.2 million expansion, creating over 40 new jobs with an average wage of $60,000. Taking into account all these demographic factors, an informed investor may consider Botetourt County as an extremely favorable area for residential and commercial investments.